A little more motion at work is never a bad thing. We could all do with stretching our legs a little bit more each day. 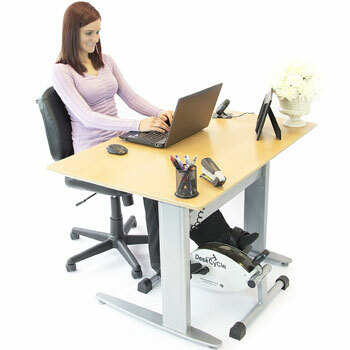 Mini exercise bikes, or under-desk pedal exerciser are a great tool for all those that want to get a little fitter at work. 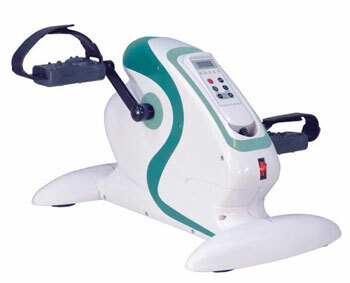 1) GymMate Mini Exercise Bike. 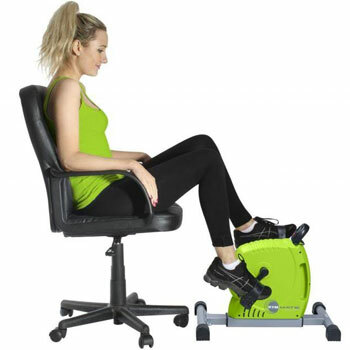 They provide a way to gain a little motion in the legs, and burn a few calories, while users are confined to the trappings of the office desk. The best machines are those that offer the top mechanics and features of a typical exercise bike, but do so within a much more simplistic and compact machine. This means a good flywheel and enough resistance settings, but little else other than the pedals and perhaps a console for the data. The following three models provide a good blend of power, resistance, convenience and simple designs for a great user experience. Each also has a unique selling point to enhance the appeal further. The first thing that stands out with this GymMate magnetic mini exerciser is that this is a pretty large and sturdy machine. This could be an issue for some users, those that want the most compact, portable model possible. However, this also means a larger base for a stable workout and plenty of room for the large flywheel. The additional bonus here is that the stabilisers retract for portability, and there is a strap to attach it to the chair. This should help to provide a little more peace of mind about the security of the workout and ease of use. This model is designed to be comfortable from a typical office chair, with the added bonus of the low-impact motion of the Neo Magnetic Drive. The second benefit here is that user can still get a pretty good workout from this machine, even with this low-impact approach. There is plenty of resistance for a good session where users can build muscle, increase their circulation and burn a few calories. The display then offers a decent estimation of time elapsed, speed and calories burned. This is great for all those keen on a daily session. 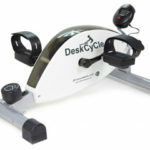 By comparison with the GymMate under-desk cycle above, this DeskCycle bike really is a small and portable option. It has great potential for users to take it to different locations with greater ease. This means that it can travel to the office, but also stay at home under the desk for work-from-home days. This model measures just 24cm, with the promise that it works under desks as low as 69cm. This is perfect for larger users that fear bashing their knees as they pedal. It is also pretty light, so shouldn’t be difficult to move around. The other interesting thing about this machine is that it is actually as quiet as promised as well. There are plenty of machines that claim to be whisper-quiet, but then creak and whirr away. This one barely seems to make a sound. This is perfect for communal office environments, as users can pedal away without disturbing anyone else. Users can also pedal pretty hard for some great results. There are 8 resistance settings here for great progression and the data appears on a desk display. The aim here was to provide the same power and performance as larger machines, just with a lower profile. The positive feedback shows that they achieved this. The first thing that stands out with this machine is the focus on medical needs, rather than office fitness. 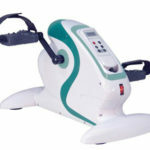 Mini exercise bikes have multiple purposes for those looking to get fitter. For many, this means a simple motion to gain mobility due to an accident or disability. 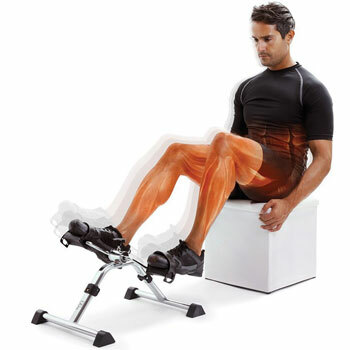 This machine works to provide great motion for arms and legs. It does so with 12 different speed settings, to increase intensity and progress. This is ideal for those using this as a therapy device to increase range of movement or muscle strength. There is also the helpful inclusion of the remote control, so users don’t have to bend down to change the settings. This adds to the ease of use of this machine, which is also seen with placement of the buttons, the straps on the pedals and portable nature. Users can place this in any room for exercise by their rules. This portable, versatile machine looks more like a medical device than the other two, but really does serve its purpose for many happy users. This original model of the MagneTrainer looks like a typical sit down pedal bike with a compact body and simple pedalling motion. It is sold as a lightweight, manage option for general and therapeutic use, with the promise of the same build quality as full sized machines. There is also a small on-board computer for basic data on distance travelled, time elapsed and theoretical calories. 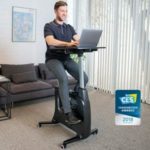 There are two factors that make this portable mini exercise bike stand out, despite the boring black design. 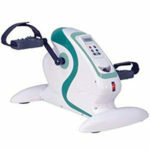 First of all it promises to offer more than double the range of resistance as other top rated mini exercise bikes. This should mean greater room for progression for those looking to build fitness or rehab injuries. The other factor here is the use of accessories. The adjustable velcro straps come as standard for security. However, there are add-ons sold separately. These include ergonomic handles for improved accessibility, extra large pedals for added security and a PC game interface. Ultrasport really do try and sell this model as a great tool for exercising both the arms and legs – with the sense that this is a great therapeutic tool. It should be just as easy for buyers to use this for arm exercises as leg exercises. It sits on the ground with a stable base, and enough resistance levels to increase the difficulty level while pedalling. However, the light 6kg weight and design of the feet means that it is also suitable for use on a table for strengthening arms. Whatever the focus, users can track their progress via the on-board computer. This shows time and distance, but also theoretical calories and the number of rotations. The latter is a great tool for those trying to make small, noticeable improvements. This, the simple manual dial and the lack of noise all contribute to a great user experience. It may be for beginners, but it can really help. This Reviber “Exerciser” is a device that does things a little differently. It doesn’t want to associate itself with typical exercise bikes at all, mainly because of that motorised approach. There are no levels of manual resistance here. Instead, users can pick between 5 programmes and 12 speed settings and let the machine do the rest. It takes users through specially designed sequences that should help with tone and fitness in the legs. There is also a remote control to aid with the accessibility of this machine. Otherwise, the design of the machine is pretty similar. There is a nice compact body with a stable base – one that should fit under any desk. It sits on the included non-slip mat and has large pedals for added security. This approach wont suit everyone, but it is an interesting idea for those that don’t really know where to start with their workouts. Some machines, such as the Riviber bike above, like to offer something a little unusual. 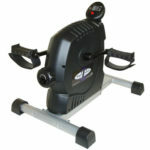 Other top rated mini exercise bikes prefer to try and tick all the right boxes for the average user. This Homcom portable model is definitely one of those machines. There are no weird features that immediately stand out. However, it does have all the basics that users want from an entry-level machine for basic fitness. The build of this machine is sturdy and compact, with a strong case around a 2kg flywheel. 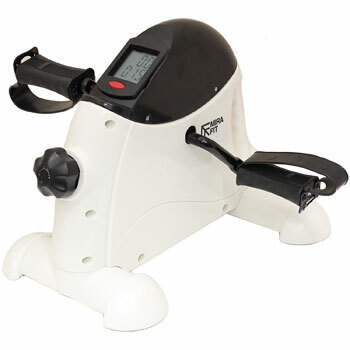 Users can adjust the resistance manually as they work out via the strapped pedals. They can then track progress on the LCD display. This includes data on their time, distance, rotations and calories burned. The main aim here seems to be improving circulation in a simple, accessible machine. It is therefore a good entry-level machine for those struggling with mobility issues. 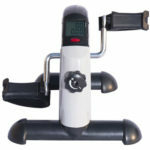 This HRS Adjustable Exerciser is a model that really pushes the idea of portability. 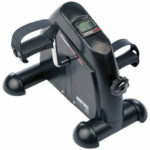 Most of the other models in this guide to the best mini exercise bikes stick with a small, lightweight body. Here there is a more unusual folding frame. It folds out into triangular shape with a small computer in the frame, and two pedals coming out the hinge. It folds down into a small shape for easy transportation and storage. It looks as though it should be a more wobbly device because of this design. Yet, there are large stabilising feet on the bottom for security. 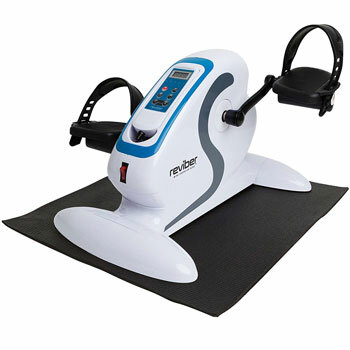 Again, there is adjustable resistance with this model to help users work on their fitness. Here this means office workers and those on the go that want to keep this under the desk. The console provides data on time, revolutions and calories. Also, while the name NRS Healthcare can be confusing at first, this is actually a supplier to the NHS. This Mirafit Arm & Leg Mini Exercise Resistance Bike is one where the designers really wanted to promote the ease of use to different users. There is even an oddly-friendly look to the bike, with the curved shape and design that is almost robotic. This device has a manual knob to switch resistance levels, a carry handle for portability and non-slip pads on the bottom. These pads are great when using this on a table for arm exercises. This dual purpose means that there is a lot of potential for fitness and rehab with this bike. The 1.5kg flywheel offers a decent motion to help with muscle tone and circulation. Users can work out as hard as they want with the security of the feet and the straps on the pedals. There is also plenty of helpful data on the session via the built-in LCD display. The final model to look at with these best mini pedals is another that wants to help people with both their arms and legs. Again, this is a folding model with a similar frame and approach to the one above. However, this 66fit Folding Arm and Leg Pedal Exerciser is a little more sleek and better looking. The reason for this is the lack of any on-board computer. There is the folding frame, long stabilisers with rubber feet, two pedals with straps and a resistance knob on the top. This makes this home physiotherapy mini stationary bike the most simplistic machine yet, and there are pros and cons to this depending on your aims. Those that just need the motion for circulation and flexibility can still do well with this model. The resistance levels are still helpful, even if you can’t see any data on the revolutions. Finding the right mini stationary bike for your needs. 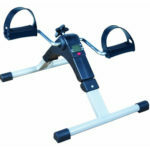 As you can see from these top rated mini pedal exercise machines, there are different approaches and designs out there. They can look similar on the surface, but hide a range of different features and benefits. Some are more robust for a sturdy approach to an effective workout. Some are smaller for greater portability, while still retaining enough resistance options. Then there are those for less able users rehabbing injuries. Find the style and specifications that meets your needs and situation for the best result.